Their relative importance and mutual relationship as two related but different sources of knowledge and guidance. A Futile Debate. The fallacy of those who say “The Quran is sufficient, therefore, Hadith, is not required” is quite obvious. One cannot both believe the Quran and disbelieve Hadith unless one actually does not understand the Quran. Of course, the Quran is sufficient as a source of guidance. But then you should really develop a relationship with the Divine Book and use your abilities and skills in understanding it. And how there can be doubt concerning the importance of Hadith; while the Quran itself establishes the necessity of the Sunnah (whose reports we get through Hadith). Hadith is definitely a most significant source of Islamic knowledge. Instead of wasting our time in the futile debate above we should try that the Muslim people revive their relationship with the Quran so that the above point is clear to them. Unfortunately those who try to establish the Hadith is also required, through their wrong argument that the Quran is not sufficient say very little concerning the mutual relationship of the Quran and the Hadith and their relative importance. Very naively, sometimes they would place the Quran and the Hadith parallel to each other saying “both are required” – as if the two were equal in importance, in all respects, and no priorities were involved in deriving guidance through the two sources of knowledge and guidance and as if there was no meaningful relationship between the two. 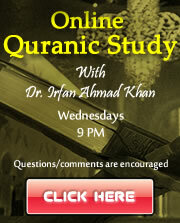 The Priority of the Quran is something concerning which there should be no disagreement in the Ummah. The Quran always places “obey God” before “obey the prophet.” And the hadith also places the Book before the Sunnah. Of course it is important that we understand the nature of this priority. Due to our interest in issues of methodological importance, we emphasize the following points. Should we say that in such a hadith meanings are revealed from God and these are given verbal form by the prophet? (or maybe by Jabriel, it is important that Hadith Qudsi should be defined as riwayah lul ma’ni – “a report of what God said in the Prophets words.” In Hadith Qudsi; inspite of the fact that God is in the first person, it is the Prophet (or maybe Jabriel) who is conveying in his own words what, apparently, God is saying. In the Quran, it is God Himself, Who is speaking a language which humans speak. But language is only a medium through which the Divine expression is taking place. Otherwise the linguistic expression of the Quran is free of all human elements. The linguistic expression of the Quran is free of all human elements. The linguistic expression of the Quran is Divine even when God is in the second or third person and when some human being(s) or angel(s) or jinn are in the first person. On the other hand, the Sunnah introduces a human (or at least a non-Divine) element in guidance. Perhaps this difference between the Quran and the Hadith was not clear to Fazlur Rahman who made such a revelation. He brought the human element in the Quran, the way it is only in the Hadith. The Prophet applied (the guidance of) the Divine Text to the human situation which he and his first believers encountered. He explained the Divine Words – through his action and speech – to his first addressees. c) without any mistake because, the Prophet alone worked under direct Divine Supervision. b) as its abilities to understand and grow with the progress in human sciences, art, and literature, etc. c) and do it collectively – correcting and appreciating, mutually. d) as they keep the Sunnah of the Prophet before their eyes. (i) To have a true understanding of the Sunnah we must keep before our eyes the Quranic text which is, thus, being explained or interpreted or whose practical implications are being worked out through it. 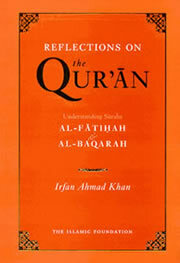 (ii) It is also required that we consider the people to whom this text is being directly explained by the Prophet i.e. consider their abilities and skills to understand, due to their being at a particular stage of human development. In the above, F(i)-(iii) aim at restricting the understanding of Hadith by way of these three considerations. Now it is important to note that the progress of (authentic) Quranic understanding should not be hampered by such restrictions. 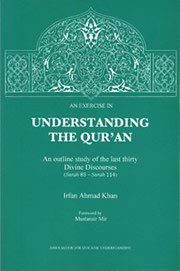 As suggested in the above the believing community which maintains its direct relationship with the Revealed guidance in Divine Words continues understanding its text afresh in changing human situations and with its growing abilities to understand, while guidance of hadith is essential, Hadith role should not be misunderstood as being restrictive of Quranic understanding. Hadith being an understanding of the Quran and not vice versa, keeping the Quran before our eyes is required more in understanding the Hadith, the way keeping the Hadith before our eyes is not required in understanding the Quran. It has the possibility of being a mistaken understanding of Divine Words or it may fall short of being a right understanding of RGDW. And even when it is free of such a mistake, this understanding is limited by our limited abilities to understand – due to our being at a certain stage of scientific and technological (etc.) development. Due to differences of calibers in a human being and the Divine Being, our understanding as well as the linguistic expression in which we express this understanding always remains far below the Divine counterpart of it. Due to this qualitative difference the linguistic expression which we use as a substitute of the Divine Expression e.g. via translation remains an extremely poor carrier of possibilities of meanings inherent in the Divine Text and our dependence upon it will block all progress of Quranic understanding.